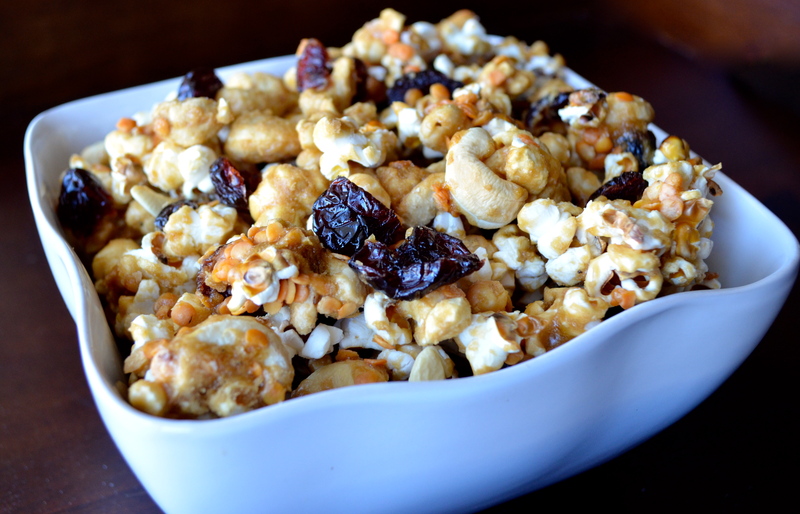 Caramel corn is loaded with nostalgia for me; when I was young, it was a tradition to make it when we would sleep over at my grandma and grandpa’s house. I’m pretty sure that grandma didn’t load hers with lentils, but she’s definitely the first person I think to tell when I have a hankering for this salty sweet deliciousness. 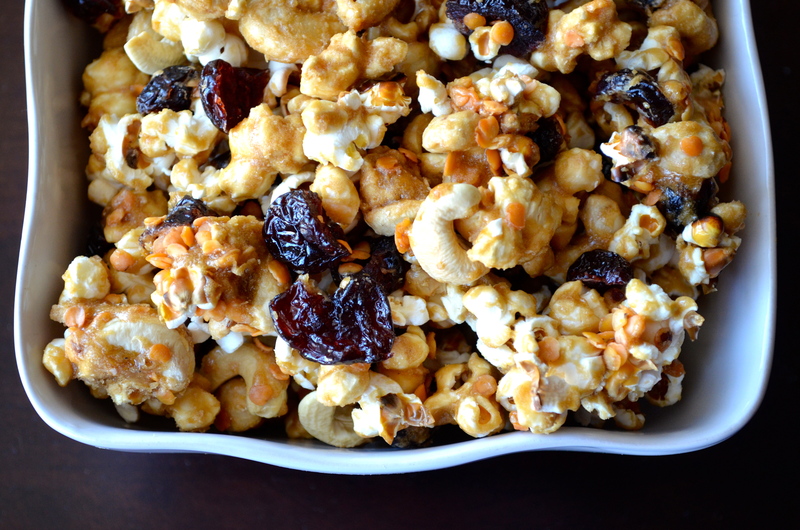 Sweet, salty, crunchy, chewy… This maple-kissed caramel corn has all your favorite tastes and textures rolled into one. Of course, if you have a hot-air popper (which I don’t have), you can nix the step for making the popcorn on the stovetop, and use the appliance, instead. Along with the Chocolate Peanut Butter Truffle Pie, this was made for the Lentil Recipe Revelations Challenge. Soak the red lentils in about 3 cups water for 4 hours. Drain, rinse well, and drain again. Preheat the oven to 350 degrees F. Spread the lentils in a single layer on a large baking sheet. Sprinkle with salt. Bake on the centre rack for about 30 minutes, until the lentils are crisp. Cool completely. Once the lentils are cool, preheat the oven to 250 degrees F. Lightly oil two baking sheets. Melt the coconut oil in a large pot or dutch oven with a tight-fitting lid. Bring to medium-high heat. Add the popcorn kernels and cover. Let cook until the kernels begin to pop, then reduce to the heat to medium-low. Continue to cook, shaking the pan frequently, until the popping has slowed down. Remove from heat. When the popping has stopped, pour the popcorn into a large bowl. Add the crunchy lentils, dried cherries, and cashews. Put the brown sugar, maple syrup, and vegan buttery spread in a medium pot. Bring to a boil, and cook for 4 minutes, stirring once. Remove from heat, and stir in the vanilla extract, salt, and baking soda. Mix well, then working quickly, pour the mixture over the popcorn mixer. Mix well (a metal spoon is easiest here) to coat. Spread the mixture on the two baking sheets in a single layer. Bake on the centre rack for 35 minutes, stirring once halfway. Let cool at least 15 minutes before serving.